Enjoy your next seaside escape in a spacious, split-level headland holiday home. 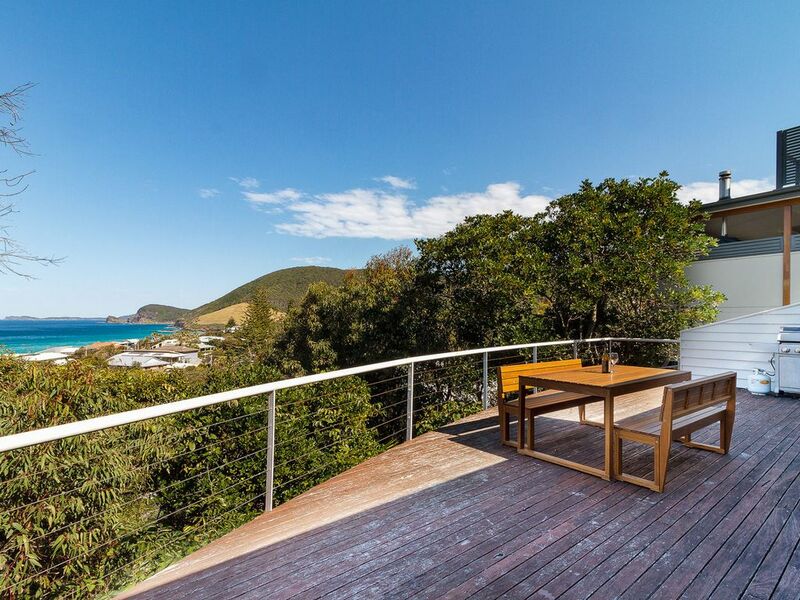 Boasting a lovely large entertaining deck with fantastic views over Blueys Beach through to Seal Rocks, youll relish the chance to watch the whales migrating and dolphins at play. Enjoy your next seaside escape with a spacious, split-level headland holiday home. Boasting a lovely large entertaining deck with fantastic views over Blueys Beach through to Seal Rocks you’ll relish the chance to watch the whales migrating and dolphins at play. Only 3 hours from Sydney youll find Duggan House, a spilt level holiday home featuring an open plan kitchen, dining and living area with combustion fire, which opens onto a large entertaining deck. Here youll revel in the fantastic views over Blueys Beach, spanning through to Seal Rocks. Ideal for one couple or two or a family to enjoy, youll fall in love with the picturesque Pacific Palms region, one of Australias favourite holiday playgrounds. Famed for being the beach which guarantees a good wave, Blueys is undoubtedly a favourite with surf enthusiasts and those who enjoy a stretch of secluded sand with incredible views. Said to have gained its unusual name due to a cattle mishap enroute to Yarric Mountain (the hill on the southern end of Blueys Beach), locals proudly proclaim this to be one of the worlds finest beaches. Offering protected corners for those who want to watch the swell from afar, this lush stretch of coastline is framed by forest-covered headlands and nestled between Sandbar Beach to the south, and Boomerang Beach to the north.